All good things must come to end and Battlestar Galactica had it’s series finale last night. I find I have mixed feelings about the final episode, which I will discuss after the break. I really liked the show but agree with the decision to end it. The best stories have a beginning and an end and while I have some issues with the ending, Battlestar Galactica had a decent ending. Ngee Khiong posted 39 photos of the upcoming PG Red Frame Astray. I have to say, this is an amazing model. He also found someone who assembled one an placed it next to a PG RX-78-2. Nothing, but I did just buy the Blu-ray edition of “Kiss Kiss Bang Bang” with Robert Downey Jr. and Val Kilmer. One of my hobbies is assembling Bandai Master Grade (MG) Models and lately, Bandai has been releasing some really good ones. One that I thought was over the top, but in the original Anime, is the Master Grade G Fighter. Naturally, Dalong.net (Excellent Site, but in Korean) has got one and is reviewing it now. Just like the Anime, the Version 2.0 MG RX-78 Gundam can be loaded into it. I won’t be getting one, but look forward to Dalong.net assembled photos of it. 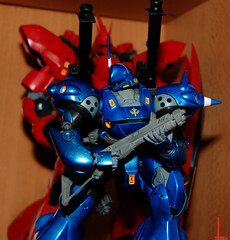 In related news: Ngee Khiong (another great site) has new photos of the New Perfect Grade (PG) Red Frame Astray. To put it mildly, it looks fantastic (the gold detail on the sword is a great touch!)! You can see full size images here at Xhood an and here at Toysdaily. I have quite a queue of models to build and won’t buy any soon, but the latest offereings from Bandai really are incredible. “Good Morning Britain” by Aztec Camera from the “Stray” Album. You can see the video here.